Why couldn’t YouTube pic a more flattering thumbnail shot of me? Taking 14 little Wal-Mart vases over to the Ronald McDonald House today with my friend Gina. She is in charge of coordinating table arrangements for the RMH here in Augusta every week. I found these Cyperus papyrus stems at a friend’s garden while I was visiting and decided they would be perfect for the tables. A whimsical change up from flowers! 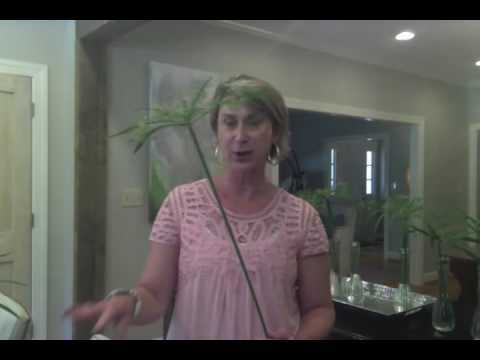 They are my new funky hat–Cyperus papyrus or umbrella plant. Here is the lineup of umbrella stems before we packed up. Of course my phone did not have enough space for one more pic, so I’ll follow up next Thursday with you on how the umbrella stems held up! Hope you are enjoying your summer and all the beautiful plants you have to choose from!